Even before I started for my business trip to Malaysia I was all excited about green worm like things. 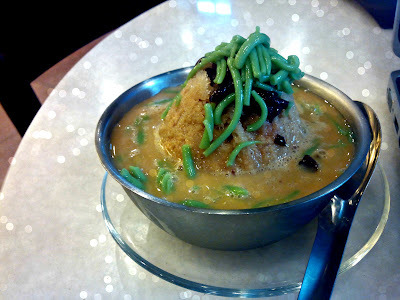 People in South-East Asia especially Malaysia love them and call them Cendol. I can totally relate to this, we Indians have faluda which is a close cousin to the green worms. So with enough research on my hand I decided that I was definitely tasting this. I wasn't sure how red beans would taste in a desert I didn't have it until my last weekend in the city. I am so happy I had it as now I know I don't want to have it again. Yes people love it i know but I can't take so much coconut especially when it is mixed with an insane amount of sugar. Then again maybe where I had it wasn't the best place to have it. Did you like Cendol? Where's the best place to have it?